Diamonds are forever - I underestimated this statement until I bought my first diamond. I never lured for diamonds until I started shopping for one. I guess sometimes ignorance is bliss because the more I started to read about diamonds the more obsessed I became. Not about buying them but trying to understand their quality measurements in terms of cut, color, clarity and carat. It amuses me that these small tiny shining elements made up of tightly compressed carbon molecules mean so much more. Materialistically speaking there is nothing in the world that makes a woman happier than being gifted diamonds, well its true for most women. I still haven't figured it out what is it exactly about diamonds that make them so desirable. Is it because they are so expensive or because of their shine and appearance or because of the emotional value it holds. Anyways what ever could be your reason, you need to be extremely careful from where you buy it. Never buy diamond jewelry without a trustworthy certification. So today on the blog I want to introduce you to Manubhai Jewellers , a reputed family owned business who having an expertise in designing gold and diamond jewelry for over 5 decades now. They have a huge luxurious store in Borivli West, Mumbai. I had the privilege of collaborating with them few months ago. I was elated to wear their custom designed diamond jewelry for the shoot, I admit thats my first time I was wearing all real diamond accessories. You should check their diamond collection here, when I saw these my jaw dropped wide open. Here are two of my favorite picks. Look A. 18 K white gold neckpiece with matching earrings. Studded with round diamonds and south sea pearls. · Cocktail Ring is a creation from a floral inspiration with diamonds, baguettes and south pearl. Look B. 18Kt white gold bridal neckpiece, with round diamonds, semi-precious emerald and delicate enameling. Stunning necklace Ananya! Both look very pretty on you! Gosh...u look gorgeous..perfect model for the perfect jewellery. You look stunning! Love the collection. Hi Ananya! This is such a great post and you always look so pretty! I love the diamonds and your black outfit! I always read your blog but since I do it from my mobile, I am unable to comment :( Keep up the good work! 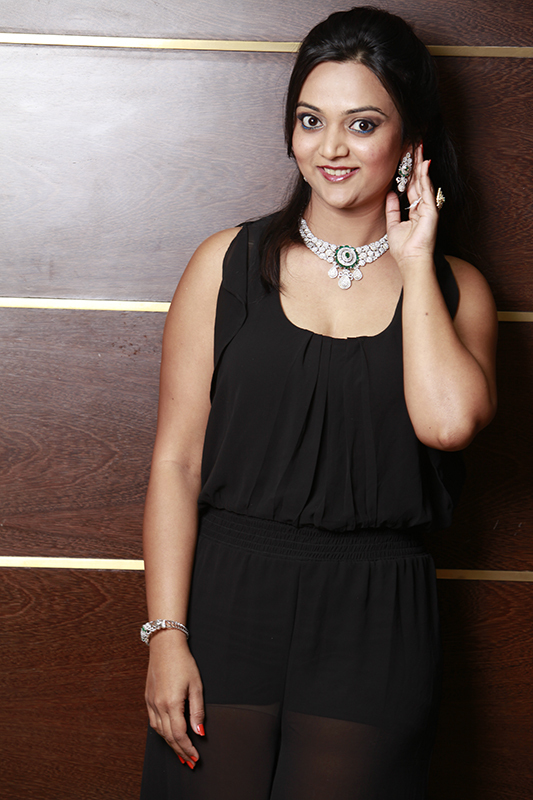 That's what I always say ....if you want to party, go to Cartier ;) Beautiful jewelry, Ananya. Stunning! wow and wow Ananya! I am so impressed with all the wonderful collaborations you put together! Since everybody knows in which Jewelry Designs is quite pricey and also treasured, thus we have to look closely at the way to guard Jewelry Designs.